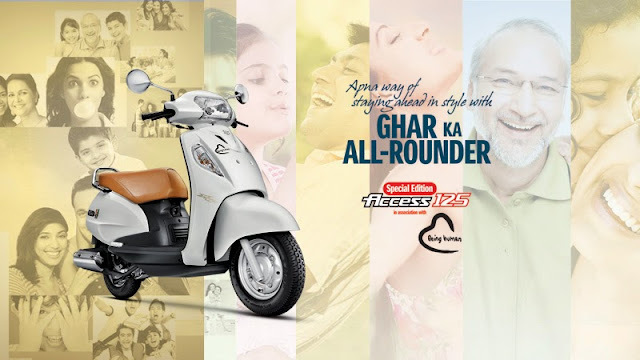 Suzuki Access Special edition launched in India at Rs 58,975, join hands with Salman Khan's "Being human"
Suzuki two wheelers today launched special edition of their popular selling scooter "Access 125". The new variant would be simply called Suzuki Access 125 Special edition with many new features added at slightly higher price. The same is being priced at Rs 58,975 units. In terms of features, the new variant gets chrome side mirrors, some more chrome on the body, tanned leatherite seat cover, Being Human logo placed near Access logo. New body stickers also form part of the scooter. This special edition Access will be offered in a single body color called Pearl Mirage White. Suzuki is expecting to sell about 40,000 units of this special edition which is priced at INR 58,975 (on-road Mumbai). For reference, the regular Access is priced at INR 57,887 (on-road Mumbai). The company has partnered with Salman Khan's "Being Human" to roll out these special scooters. The company also announced that a certain portion of their revenue (earned from selling this special edition Access and various ‘Being Human’ merchandise) will be used to educate the underprivileged apart from conducting cataract operations and heart surgeries.